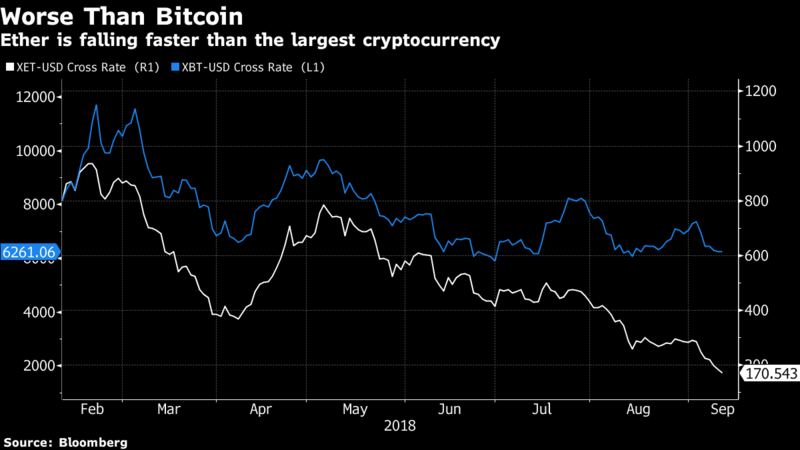 The second-biggest cryptocurrency’s slide is deepening as a soaring number of short positions signals traders are betting the pain isn’t over yet. Ethereum’s Ether had an eye-popping rally, jumping from less than $10 at the start of 2017 to as high as $1,300 in January, according to CoinMarketCap. The fall has been just as spectacular as the digital coin plunged 85 percent from its high in only seven months, piercing through $200 Monday, while short positions on cryptocurrency exchange Bitfinex climbed to the highest ever. Regulatory uncertainty, disappointment that mainstream adoption of cryptocurrencies has been slower than some anticipated and concern that institutional investors are getting cold feet, contrary to last year’s expectations that they were almost ready to jump in, are weighing on Ether and the broader market. One of the differences for the token built to run what’s known as Ethereum’s world computer, is that some of the startups who used it to raise funds have started to cash out. Startups spent 119,000 Ether on the week ending Aug. 29, the most since January, according to data compiled by research firm Santiment. Still, other analysis shows many startups are still holding most of the funds they’ve raised. Research firm Diar Ltd. analyzed 50 projects and found they were holding 3.7 million Ether in August, just slightly down from 4.5 million in April. Diar head analyst Larry Cermak said the data shows reports that ICOs are selling most of their Ether have been overblown. But to some that’s a negative sign as it means startups have enough supply to potentially crash the price. Another source of concern about Ethereum’s future is whether researchers and developers working to increase the network’s capacity will be able to do it in time to beat the growing competition. Ethereum now handles about 15 transactions per second, compared with Visa’s 45,000. Ethereum is the platform where a large majority of decentralized applications are built and ICOs to fund them helped fuel last year’s cryptocurrency boom, as traders flocked to buy the hundreds of new digital coins springing up. But very few of those applications have gained mainstream adoption and most haven’t even released a product. A Satis Group report earlier this year said about 80 percent of ICOs were outright scams. Vitalik Buterin, who wrote the original Ethereum white paper in 2013, has expressed his dissatisfaction with the lack of real-world applications for blockchain projects, and in an interview with Bloomberg New said further cryptocurrency growth should come from actual use. Based on Ether prices, the market seems to be as disappointed as Buterin.